Datamine works with clients to help them create and develop the analytics infrastructure necessary to successfully implementing and benefiting from a marketing automation platform. HOW DOES DATAMINE HELP WITH MARKETING AUTOMATION? 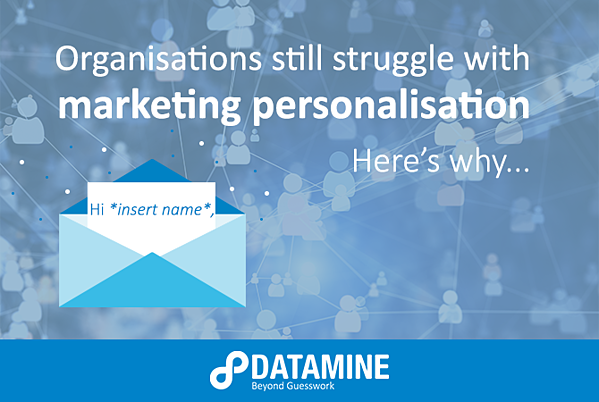 Datamine picks and supports the best technologies on the market, meaning we don’t have our own platform that we try to push – rather, our marketing automation solution revolves around helping organisations lay the foundation for realising marketing value through whatever platform they choose. Many companies jump into marketing automation before they’ve sorted out the underlying data, and without that infrastructure in place it’s very difficult to see real value from any automation platform. Data is critical to successfully running a marketing automation platform, and the best way to sort out and collect the necessary data is through a marketing datamart. Our team are datamart experts - both in the build and the implementation – so we’re well-equipped to help clients prepare this key source of data for their marketing automation platform. Once the data has been sorted, the first step towards running highly targeted and personalised marketing campaigns is ensuring the business has a clear picture of their customer – Datamine helps clients create a single customer view through profiling and segmentation, providing them with the knowledge they need to target various market segments. From there, we use our internal expertise to develop a framework for the complicated targeting and personalisation, such as creating new targeting variables, developing complex customer lifecycle workflows, getting the right offer to the right person at the right time etc. Above all, our focus is on helping our clients build their internal capabilities while providing them with the support and infrastructure they need to start the journey. We have a flexible operating model that supports clients however they need, including as those needs change over time. Datamine operates a hybrid model where our clients have access and so do we, meaning the power is kept in-house but they still receive the backing to the extent they need. In many outsource models, businesses hand over all the agency to a third party that handles the entire marketing automation process. This is risky in the long run, as it leads to a lack of transparency, communication and development of internal capability. Interested in learning more about how Datamine could help you with your marketing automation efforts? Fill out the form below to schedule a call with us.